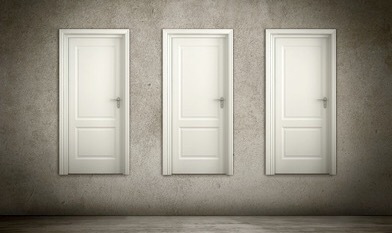 OBSERVATION: How do I deal with closed doors in my life? When I meet opposition, when I face a setback, or when the door slams shut in my face, how do I respond? I can either become discouraged and withdraw, or I can position my heart in persevering prayer. As I pray, as I seek the Lord, He will give me discernment on what kind of closed door I am facing. There are three types of closed doors that come to my mind – doors that the Lord closes, doors that are closed because of my own actions, and doors of opposition placed in front of my by the enemy of my soul. Each type of door requires a different response. When the door is closed by the Lord I need to surrender to His will. He is the one who opens doors that no man can shut, and shuts doors that no man can open. When the Lord closes a door in my life it is for my protection and provision. It is to keep me from the wrong pathway, to protect me from dangers and perils unaware. It is the loving provision of His sovereign hand of mercy. As I pray, His peace will be the assurance that this is a door closed by His hand. And when I have that assurance I need to trust Him for the pathway and the right door that will lead me into His will. When the door is closed by my own actions I need to ask the Lord to search my heart. Did the door close because of sin in my life? Did I simply miss something of importance that I should have done? Did the door close because of some offense with another? When the Lord reveals this to my heart I need to take the proper action. If there is sin in my life – I need to repent fully. If I have neglected something important, I need to go back and take care of this and rectify the matter. If there is a known offense between me and another person, I need to work toward reconciliation. And after this is done, I need to submit this door back to the Lord and trust Him for His guidance. When the door is closed by the enemy, I need to position myself in faith. Paul’s door to visit the believers in Thessalonica was closed by the direct opposition of Satan. Paul knew this, but at the moment could not do anything personally about it – except position himself in faith and trust in the Lord. Yet, Paul did one important thing – he did not shrink back from pursuing the will of the Lord. Even though the door was closed, Paul knew it was the Lord’s will to extend encouragement and care to the believers in Thessalonica. Paul could not do that personally – so he sent Timothy in his place to fulfill this ministry to them. This is the most important lesson about closed doors that we can learn. So many times the enemy tries to discourage us from pursuing the Lord’s will in our lives. He knows that if we lose heart – he wins. Yet, if we position ourselves in faith, if we continue to seek the Lord, even when we personally cannot walk through the door – the Lord will provide a way. If we do not lose heart, and if we are more interested in fulfilling the will of the Lord than seeing our plan fulfilled – He will lead us into victory. It was the will of the Lord to bring the Thessalonians believers strength and encouragement. Paul was not about to let some opposition from the enemy deter him from fulfilling the Lord’s will for these believers. Paul was disappointed that he could not do this himself, but he was not dissuaded. It was never about Paul, it was always about the Lord’s will. When then enemy put up a closed door, the Lord provided another door. Paul learned to encourage himself in the Lord and to persevere through this type of closed door. Lord, I confess that I have struggled with closed doors of opposition that have been placed there by the enemy to discourage me in my faith. Too often I have lost heart and pulled back. Give me the grace and courage to persevere through these times when it is clear what Your will is, but the pathway seems to be blocked. Help me to neither draw back – nor to press forward ahead of the leading and direction of the Holy Spirit. Let me position myself in prayer and faith and with for Your direction.